Lepidodactylus lugubris does not need any special stimulation for reproduction. If the geckos feel fine they regularly lay eggs. In Lepidodactylus lugubris a single specimen only is needed for producing young. Seufer (1995) indicates that the geckos lay eggs every 14-60 days. Nietzke (1998) mentions nearly the same intervals (14-63 days). Brown and O' Brian (1993) reported that smaller females required more time between egg development and laying. Clutches usually contain 2 eggs. Young females sometimes produce poor developped eggs which often are eaten by the female. Egg size: approx. 5 mm (Seufer, 1995) to 8 mm (Nietzke, 1998). Hidetoshi Ota (1989) indicates egg sizes in the range of 8,6-10,7 x 5,4-7,6 mm, which matches the shape of the laid eggs best. Productivity may be different in every specimen. The rumours single kept geckos would be less productive than geckos living in groups could not be acknowledged by studies. Brown and O' Brian (1993) studied 38 hatchlings in isolated or social conditions (groups of 1, 2, 3 and 4 geckos housed in plexiglas enclosures of 32 x 18 x 23 cm or 10 gal aquaria). Their studies considered that pseudosexual behaviour does not have any influence on egg development and laying in Lepidodactylus lugubris, but dominance behaviour has. Isolated females produced as many fertile eggs (72%) as the dyadic females (71%). if anything isolated females required fewer days to develop and lay eggs. The three geckos at the bottom of the dominance hierarchies in the three enclosures together laid fewer egg clutches (3) than the three most dominant geckos (14 clutches). 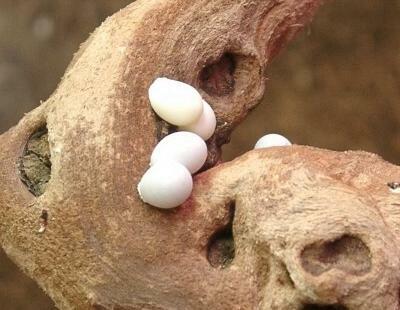 Dominant geckos grew faster, displayed external endolymphatic sacs sooner and developped their initial egg clutches at younger ages than the most subordinate geckos in their social groups. In animals of the dyad groups none was negatively affected. Winter quiescence of reproduction is lacking in Lepidodactylus lugubris. Hidetoshi Otas studies (1994) at Kita-Daitojima Island (Ryukyu Archipelago, min. 19,9°C in winter) revealed that, unlike all other east asian lizards studied that time, the populations of Lepidodactylus lugubris laid eggs almost througout the year only slowing down in November and young were found at all seasons (Hidetoshi Ota, 1994). The eggs are clearly visible through the belly skin. 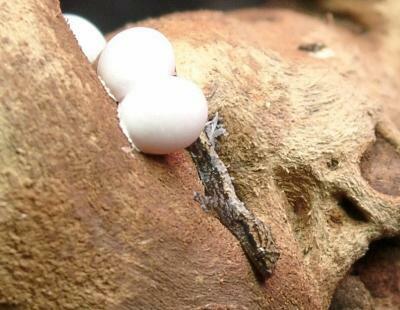 In big geckos from Guam (Clone A) also three eggs may be visible (McCroid, 1994). Often the eggs are laid to communal nests (Brown & Duffy, 1992), in their natural habitats sometimes mixed with eggs of Hemidactylus frenatus (McCroid, 1994). But they are no strict communal egg layers. My geckos favourite egg-laying area is a large branch. Also, often clutches are placed to the terrarium wall, mostly in the area of an upper terrarium corner - in one case even to the terrarium ceiling - and unfortunately to the sliding doors where they usually have to be damaged when opening the terrarium. Sometimes they lay their eggs to leaf axils, too. But I never found clutches fixed to kork. Literature informs that eggs also have been laid to bark and stone (Nietzke, 1998; Henkel / Schmidt, 1991; Seufer, 1995). Usually it is best not to remove the eggs from the terrarium. Removing eggs laid to smooth surfaces is possible without great problems but normally is not necessary. In contrast to most other reptiles Lepidodactylus (and also Hemidactylus), as representatives of the sub family Gekkoninae, lay rigid-shelled eggs with extremely low water vapor conductance. 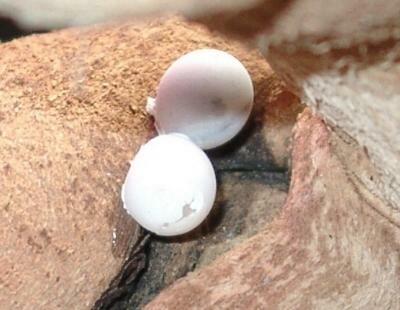 The other of the 4 gecko sub families laying calcareous eggs is Sphaerodactylinae (Bustard, 1968; Dunson, 1982). It is quite likely that both these sub families represent an independent evolution of the cleidoic egg, separate from the reptilian lineage that led to the birds (Dunson, 1982). Typical reptilian eggs require a moist substrate for normal development and undergo a water loss across the shell in dry air many times that of avian eggs. Eggs of Lepidodactylus lugubris are not only hardy against dry air. Brown and Duffy (1992) indicate that even exposure to salt water spray and emersion of eggs for short periods had no or negligible effects on egg hatching success and incubation time (Coconut Island Study). Inspite of this regularly direct spraying should be avoided. Eggs that become a little darker and spotted from inside are a good sign of development. Yellowish eggs usually don't hatch. Seufer (1995) indicates the possibility of a 90 % hatching rate of eggs left in the terrarium. 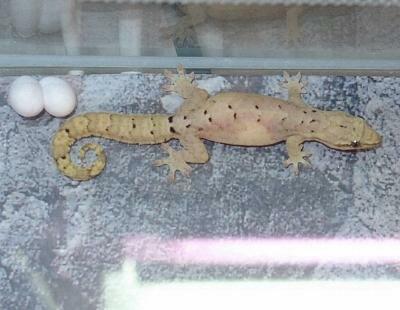 Two out of five eggs laid by three individuals of this gecko from tropical regions (Micronesia) hatched after incubation under temperatures varying from 15 to 18°C (Hidetoschi Ota unpubl. data; Hidetoshi Ota, 1994). Incubation time took 60-117 days (longer times at cooler temperatures). 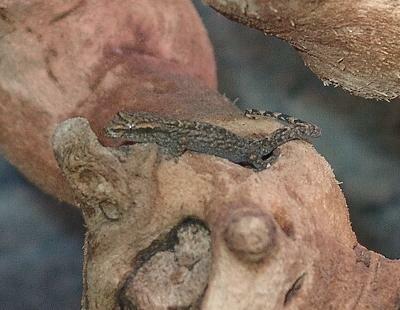 Eggs of many other geckos do not hatch when they are incubated at temperatures lower than 20°C. Even eggs of Hemidactylus frenatus, who replaces Lepidodactylus lugubris in many places, don't hatch if incubated at 18°C (highest hatching frequency is 28°C, Ota 1994). Within a field study on Coconut Island, Hilo, Hawaii, Brown and Duffy (1992) measured average temperatures at egg laying sites of Lepidodactylus lugubris ranging from approx. 22°C to 25°C depending on place (trees at the beach). Henkel/Schmidt (1991) state incubation times for Lepidodactylus lugubris of 60-100 days; Nietzke (1998): 65-95 days; Seufer (1995): 68-93 days. In summer, my gecko babys usually hatch out no later than after 62 to 73 days, during winter incubation takes accordingly longer. In clutches of my younger females often only one young/clutch hatches. The eggs of my oldest female usually hatch out all. 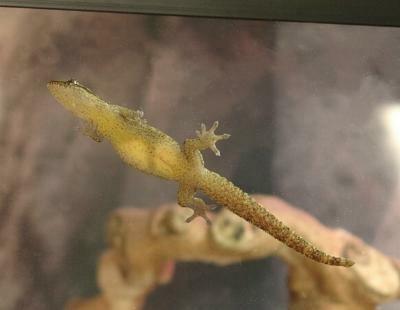 Newly hatched geckos already measure 3,5 - 3,7 cm but they are very thin. The 38 hatchlings studied by Brown and O'Brien (1993) measured approx. 18,7 mm in snout-vent length. My older geckos are more compact than the slimmer young adults. Especially the tail becomes much broader with age. Seufer (1995) and Nietzke (1998) advice to separate the young from the adult geckos. Ingo Veltum (moderator at the DGHT forum http://www.dght.de) even reports that he saw a female feeding on one of her relatively newly hatched babies. Inspite of this, I still feel that the young can be left together with the adults provided sufficient food and hiding places are available. My geckos never disturbed their young. In contrast to the above sources I even think that the adult geckos are able to distinguish even very small juveniles from prey. They "click" to them in the same way as they do to each other and then left them. As the young geckos are looking for prey also during the day and are not complicated I do not have any problems keeping them together. However: The only way to be 100% sure that cannibalism won't happen is raising the young separated from the adults. Nietzke (1998) indicates that sexual maturity might be reached at an age of 8 - 10 months. My geckos laid their first clutch at an age of 6 months, but these eggs did not hatch. In the test groups of Brown and O' Brian (1993) the average age at egg development was 290 days, but geckos varied immensely in the age at which they initially developped eggs: 194 - 392 days.